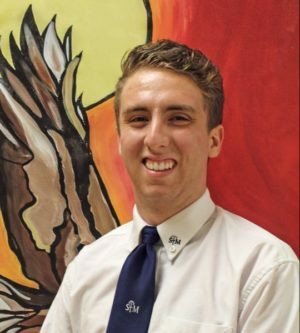 The Catholic District School Board of Eastern Ontario is pleased to announce that Michael Fenn, a grade 12 student at St. Mary Catholic High School in Brockville, has been installed as the next Catholic Student Trustee for the CDSBEO. Fenn has assumed the position from Andrew D’Alessio, who served for the 2017-2018 school year. Trustee Fenn was elected to the position in April by the Student Senate. As Catholic Student Trustee, Michael Fenn will represent the more than 12,800 students across the Board. He will lead the Student Senate, which is made up of representatives from all CDSBEO secondary schools. The Senate discusses student issues, gathers student opinion, and helps to develop communications with all students across the CDSBEO. It also provides a means for student council leaders and senators to gain leadership skills. In addition to serving on the Board of Trustees and the Catholic Student Senate, Trustee Fenn will have the opportunity to meet other student trustees, and trustees from across the province. Michael Fenn can be found on social media at @Michael_CDSBEO (Twitter), and on Facebook at www.facebook.com/MichaelCDSBEO.